Editor’s note: This post is part of our Source the Web series here on SourceCon. It features articles on how to mine particular online data resources from experts like TalentBin’s Peter Kazanjy. Of course! Meetup is a platform where interest groups can organize to meet offline and geek out over the newest and latest or just talk about what really fascinates them. And these interests can be of both a nonprofessional and professional persuasion. As such, Meetup can be an awesome site to find people of specific skill-sets, especially if you’re hiring. Moreover, while a lot of recruiters may attend meetups, the reality is that many Meetup members “join” a Meetup, but don’t actually attend except once or twice a year. 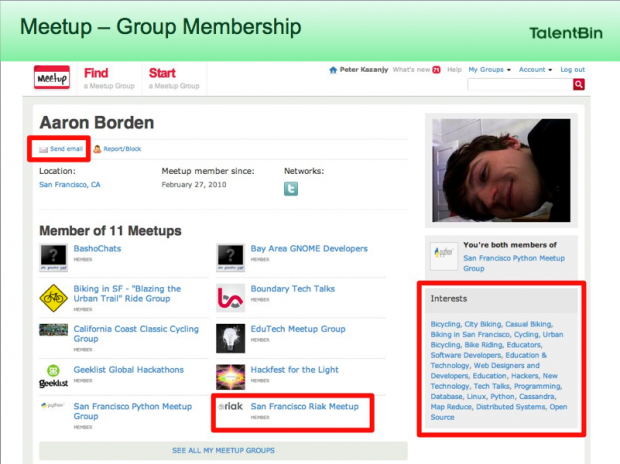 In order to make full use of Meetup’s membership data, much of which is only present on the site, recruiters should source all the data available on Meetup.com. Heck yeah! As we said above, Meetup is an online platform for organizing offline meetups around topics of interest. And that means professional topics too. Take, for example, a typical software engineer. He’s not hanging out on LinkedIn. But he sure would be excited to come see a presentation on the latest Hadoop distribution or show off his iOS side project with a bunch of other developers at his local meetup! Ultimately, people spend their time where they can share mutual interests with like-minded followers, and Meetup is one of the many sites that facilitate this interaction. Thus, with just a little massaging, Meetup can be a goldmine for any recruiter. 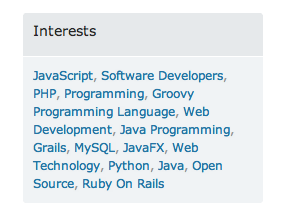 So you’re saying I can find Java Developers on Meetup? Yes already! Now let’s get to it. Searching within Meetup’s search interface allows you several options. Select to search for meetups only, or to include groups. 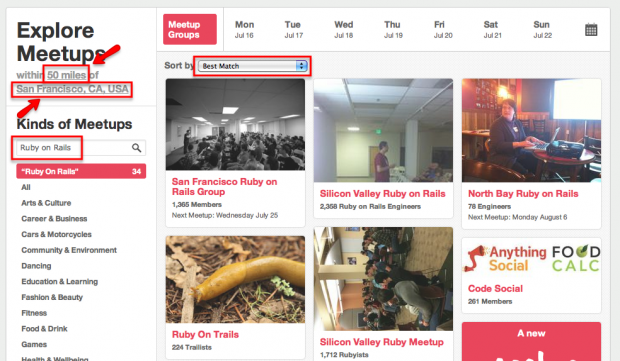 In the example here, we found the 34 Meetups in the general San Francisco Bay Area that are related to Ruby on Rails. Remember: Meetup Groups organize Meetups. 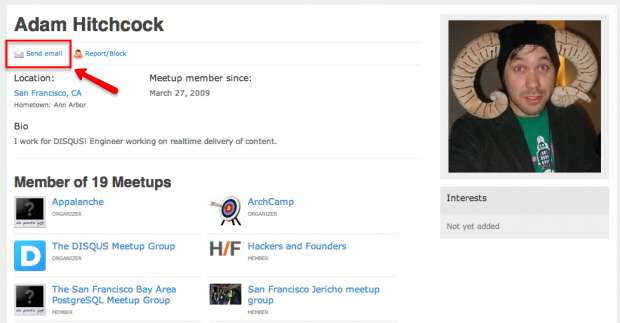 A group has many members but not every member attends every meetup. Here you will find a collection of tasty information for any hungry recruiter. The Intro describes the groups and its purpose for users. The “We’re About:” section details relevant interests (“tags”) that shows you what the group is all about. And clicking through on these interest tags is an excellent way to find other relevant groups that are about similar topics. 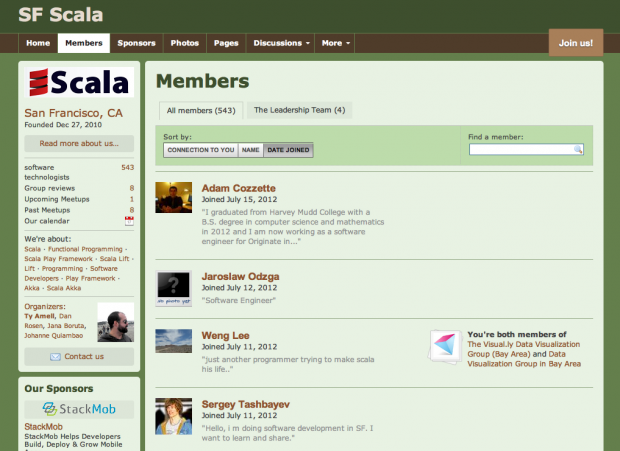 The “Members” tab will take you to a list of all the members in the Meetup group. 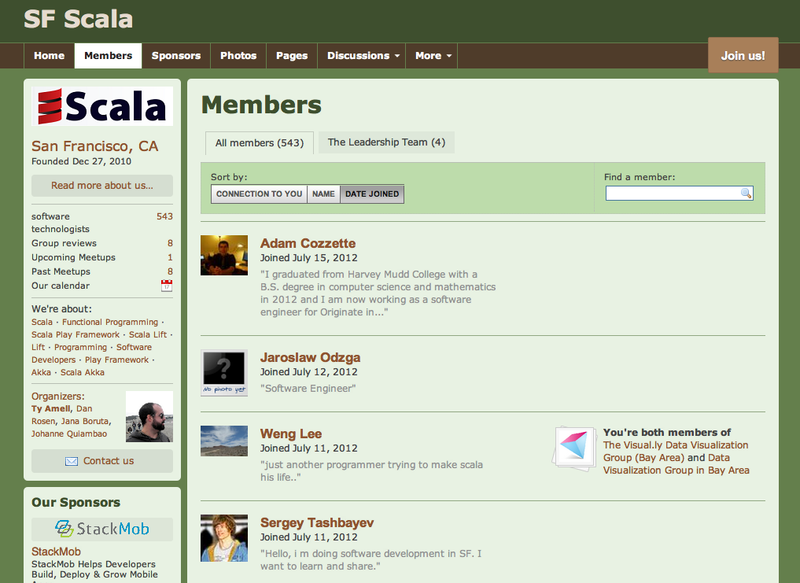 This Scala group looks promising so we click into the “Members” tab to find a treasure trove of prospective candidate profiles. Members can be sorted by connection, name, or join date. We sorted these Scala SF members by join date and, in this case, found a college grad, Adam Cozzette, who recently joined this meetup and looks eager to learn about Scala as he begins his career in SF. Go ahead and scan the member pages and briefly evaluate candidates by their bios, we will come back to discuss qualifying candidates in the next section. Now we want to talk about searching Meetup using google. Google is undoubtedly a great resource for searching the web, and with only a few simple boolean strings you can dive deep within Meetup to where all the best candidates hide out. *You can find the member ID in the URL of any member’s profile page. 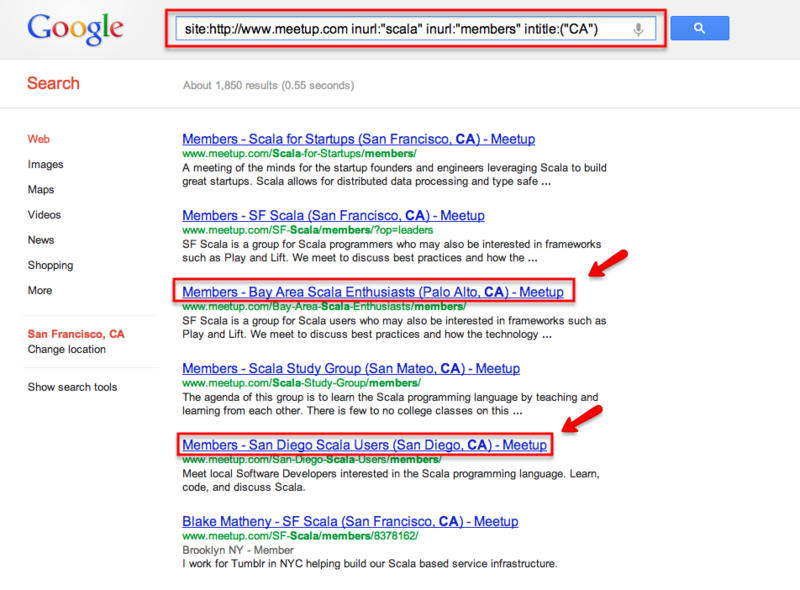 This is useful for pulling up all groups a person is a member of in a google search. By all means we don’t claim this is the definitive instruction manual for searching meetup, however, we do find that these simple tips do return a lot of excellent results and recommend you try a combination of strategies to find the candidates most relevant to your needs. So you went through meetup groups and searched upcoming events and member pages and now you’ve found someone that looks enticing. Let’s walk through how you would go about qualifying and reaching out to this stud. 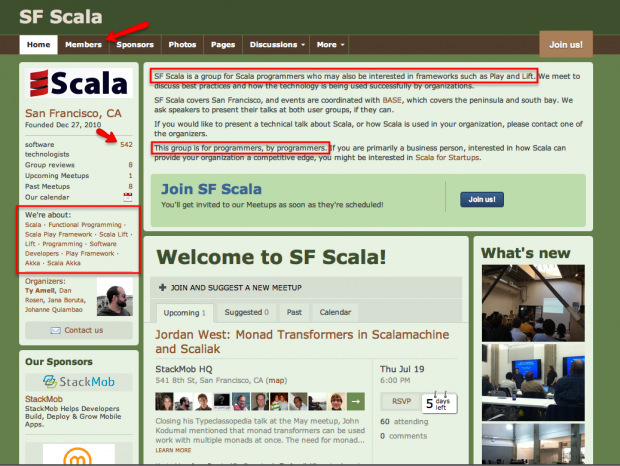 Let’s say you found your interesting candidate browsing through a scala meetup group. 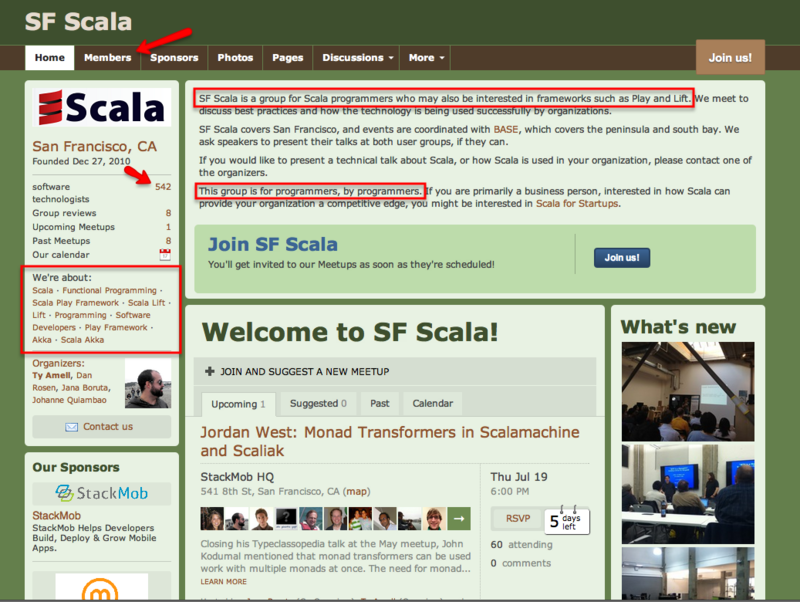 Go up to the address bar and remove the group name, in this case “/SF-Scala” and hit “Enter”. This brings you to the person’s general Meetup profile where you can see an overview of all the groups this person is a member of. In this example, we originally found Aaron Borden’s profile through the San Francisco Riak Meetup and, by removing the group name in the URL, arrived at his general Meetup profile. Now we can see that in addition to Riak, he also looks like he’s Python guy, and develops for the Linux GNOME project. Neato! Moreover, we can see that he’s into biking and education. We also see that he’s based in San Francisco, and if we want to at this point, we can reach out to him. If they don’t have any profiles listed, copy and past their name into google to see if you can find a personal blog or other communication vectors. (Based on some cursory Google research, we discovered Aaron’s favorite Xbox game to geek out over!). Finally, and another reason why Meetup is so great, Meetup offers an email option that you can use to contact any member. If you can’t find their personal email address (the best route, in our opinion!) 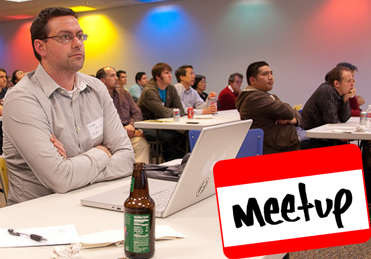 through some Google research, go ahead and send them a personalized email through Meetup! It’s going to go to their personal email address, because that’s the same address that their Meetup updates get sent to, and by now you should have plenty of information to know how to tailor your outreach to catch their interest. Phew! Now that was lengthy. Well, I can’t find the EXACT candidate that I’m looking for! Don’t fret! That’s totally OK! Even if you can’t find the exact person that you’re looking for, these are strong networks of the mavens and connectors for these professional interest groups. For each of these folks that are a member of the San Francisco Java Meetup, they each know 100 other java engineers who aren’t members. Be proactive and engage with those you do find on Meetup. Send a personal and intelligent email showing your genuine interest in what they do. Find their twitter account and follow them. This is sourcing, and as we all know (and too often, hiring managers don’t appreciate) nothing will be handed to you on a silver platter. With that said, showing you took the time to see what Meetups they attend might make all the difference in this competitive recruiting market where engineers are flooded with choices. The web is a pool of candidate information waiting to be interpreted. Candidates live where they feel most comfortable online, and leave traces of professional information as they interact on these sites. Meetup is an excellent example of this, being a platform that unites people with shared professional (and nonprofessional, too) interests. It is a source that you can use to find otherwise untraceable talent, reach out to awesome candidates, and build relationships with prospective candidates that will pay off in the future. Most importantly, it’s important for sourcers to think about harnessing the power of this web data. You can do it manually, or you can use specialized tools like TalentBin’s talent search engine provides.